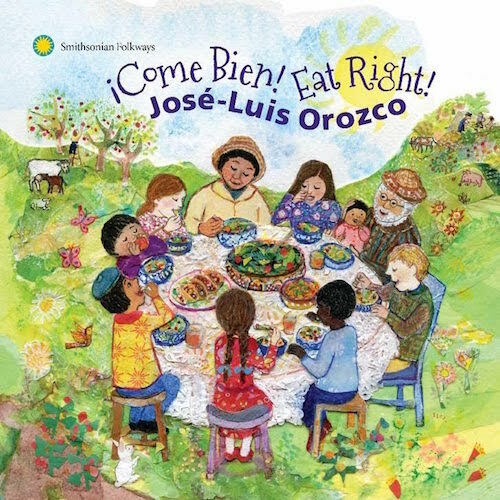 Jose-Luis Orozco has a wonderful new CD called ¡Come Bien! Eat Right!. This CD is a feast of rhythm, rhyme, and culture infused with the message to eat right and live life to its fullest. 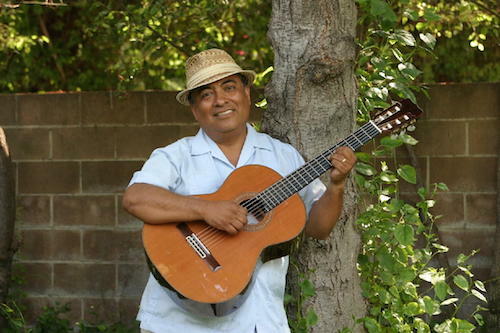 Jose-Luis Orozco is an award-winning musician, composer and educator. My children listened to his music as they were growing up, and I have been teaching with his songs for over 20 years. ¡Come Bien! Eat Right! is his 16th CD and his Smithsonian Folkways debut. Learn more about Jose-Luis Orozco on his website. Jose-Luis Orozco sings all the songs on ¡Come Bien! Eat Right! in Spanish and then in English, making the CD a fabulous resource for learners of either language. You can purchase the songs or album on Amazon: ¡Come Bien! Eat Right! The songs have contagious rhythms that encourage kids to sing and clap along. The songs teach children to choose nutritious food – a message all kids need to hear! There is a natural repetition of fruits, vegetables and other food vocabulary throughout the music on the CD. In addition to general concepts about eating well and staying healthy, the songs teach specific information. Children learn a wealth of information from balancing the food on their plates to the importance of reading food labels. As an educator, Jose-Luis Orozco wrote and performs these songs with an awareness of how children learn. The carefully chosen language, rhythms and repetition make the songs extremely effective language learning tools. This music is infused with Latino culture. Variations on De colores and Pim Pon, and rhymes like Chocolate draw on traditional songs. Lyrics filled with paletas, aguas frescas and a host of dishes draw on the rich culture of food. Grammy award-winning musician Quetzal Flores and other Latino artists play the Latin rhythms of these songs. The music conveys with an awareness and appreciation for our planet, our food, and our families. Smithsonian Folkways is the nonprofit record label of Smithsonian. They bring you wonderful music and many free resources for the classroom. You can follow Smithsonian Folkways on Twitter. This CD sounds awesome! Learning Spanish words, culture, and good habits all at once! I would love to win this CD for my kids! I would love to win this CD for my classroom! I would absolutely LOVE to win this CD for my homeschool and to use with my co-op classes. Thank you for the opportunity! Soy nueva enseñando en un colegio de inmersión en español en Minnesota ( En Colombia enseñaba en inglés) y estoy recopilando material tan bueno como este para trabajar con mis estudiantes de 1er grado. I love Jose Luis Orozco’s music! Jose-Luis Orozco is awesome! I really enjoy his music.